One could think that they’ve seen it all until they stumbled into Chandon Rose’s and &Pizza’s celebration of Pi Day this past Thursday March 14th(3/14). As an M.I.T. graduate, 3.14159 will always have a special place in my heart, however my place that certainly pales in comparison to what Chandon Rose’ and &Pizza were able to provide to Gamaliel Vallego and Estela Valerio on their wedding day. Unable to afford a wedding reception, Chandon Rose’ along with &Pizza, 1-800 Flowers, Milk Bar, Uber Eats, and BASHSDC orchestrated a wedding reception for the Gamaliel’s as well as multiple other couples in celebration of Pi Day. 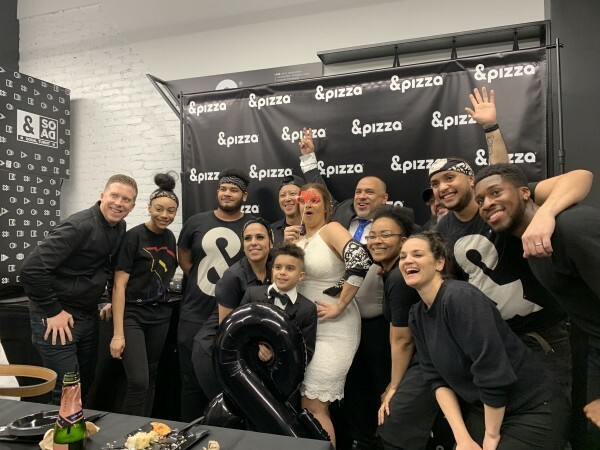 Over a dozen couples were selected to enjoy their nuptials with Chandon at &Pizza locations across the East Coast including New York City, Philadelphia, Boston, and Washington D.C. for the 4th Annual Pi Day wedding extravaganza. Gamaliel and Estela's journey began at a friend’s going away party and each knew early on that marriage was in their future. For an extended period of time wedding plans were in the making, however costs continuously came into play as a factor in delaying the impending nuptials. &Pizza's journey of wedding celebrations began in 2016 by helping a couple who was expecting their second child; the wedding ceremonies have become an annual tradition celebrating love with all of the pizza that any ring bearer could ever eat along with all of the Rose that any Father of the Bride could ever enjoy. The team of sponsors pull out all of the stops to create a fantastic fete: décor, dessert, music, and photography. Shop representatives went so far as to become ordained online so as to legally perform the ceremonies themselves as a preamble to the receptions that were provided free of charge. So pour a glass of Rose’ and pass over a slice of pepperoni as we toast the over a dozen couples celebrating the nuptials that would not have been possible without the generous sponsorships led by Chandon Rose’ and &Pizza! Let’s also raise a glass to a sliver of corporate news that falls it the positive as in this day and age it is the slivers that we must hold onto. Studies at M.I.T. Harvard, Adelphi, and S.U.N.Y. have led to a wonderfully diverse career in both fashion, finance and the arts. A consistent mainstay has always been a love for writing, food and wine. Life is meant to be passionately enjoyed and these three areas have always brought out the best in Gene who is currently an Adjunct Professor of Engineering at the Stevens Institute of Technology. Most recently he was awarded "Instructor of the Year" for his work with students.